signs and symptoms of disease. 58,000 children are treated each year at the Children’s Hospital of LA. If our creativity can inspire one child to keep fighting cancer, our mission will be complete. 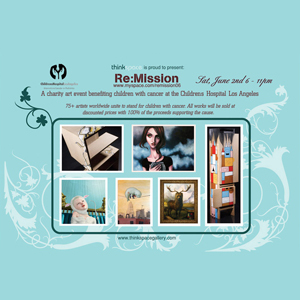 Re:Mission is an art event/auction that will benefit children with cancer at the Children’s Hospital of Los Angeles. Proceeds from the show will produce 2 things. An art book consisting of all submitted/donated work from each artist along with bio information. Copies of this book will be distributed to the kids at CHLA. Funds that will be donated to support CHLA’s amazing ART PROGRAM. This is the perfect opportunity for the art community to reach beyond itself, making a clear and visible difference.